Men & Mice Suite Version 9.2 continues to deliver on the company’s commitment to making complex enterprise IP infrastructure management, across hybrid and multicloud environments, as elegantly simple and quietly robust as customer-grade technology, but on an enterprise-grade scale. 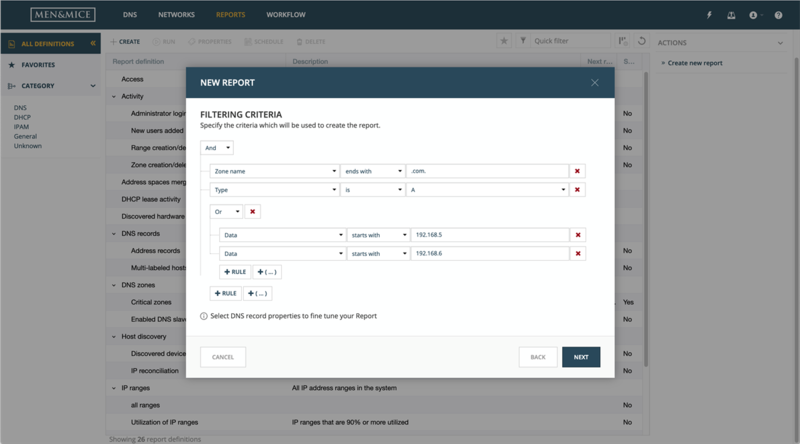 ● New Workflow module (add-on): greater ease and control of DNS management by enabling users to request and optionally schedule the fulfilment of DNS changes for administrator approval/denial. ● New Advanced Reporting module (add-on): create tailor-made reports by correlating data and templates in just a few steps, scheduling the results to be generated daily, weekly or on a custom schedule. ● Multiple account support for AWS: manage and retrieve data from AWS master account credentials associated with up to thousands of AWS sub-accounts. ● Availability on the Azure Marketplace: try the Men & Mice Suite on Azure, or implement with one-click install (with step-by-step instructions). ● A host of added functionality for filtering, quick commands, and data displays for further mobility and ease of operations. Not sure yet? Read more about the Men & Mice Suite's new 9.2 features and functionality. Beyond the consistent improvements customers have come to expect from Men & Mice, version 9.2 of the Men & Mice Suite focuses on the expansion of cloud integration, such as AWS multi-account support and Azure Marketplace availability, as well as simplifying DNS workflows and deepening reporting capabilities with new add-on modules. 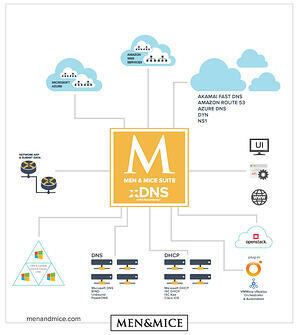 Men & Mice Suite already features cloud-native integration with AWS and Azure as well as Akamai Fast DNS, Amazon Route 53, Azure DNS, Dyn DNS and NS1 to best manage and synchronize IP address management and DNS respectively. In the v9.2 release, Men & Mice has added multi-account support in AWS, to manage and retrieve data from AWS master account credentials associated with up to thousands of AWS sub-accounts. DNS zones, VPCs and subnets can be listed for each AWS account subscription, dramatically cutting down administration while guaranteeing a global view/management of the cloud infrastructure. One of the key new features in version 9.2 is the newly introduced Workflow module for efficient request and approval of DNS tasks. 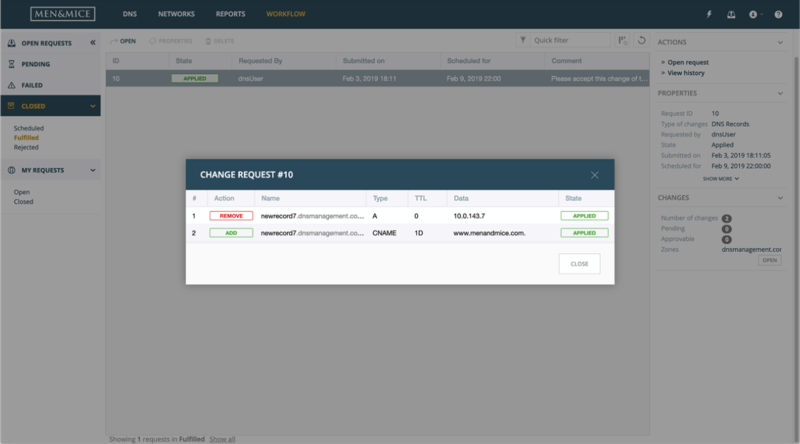 The Workflow module allows users to make requests for creating, modifying and deleting DNS records and optionally schedule the fulfillment of DNS changes. 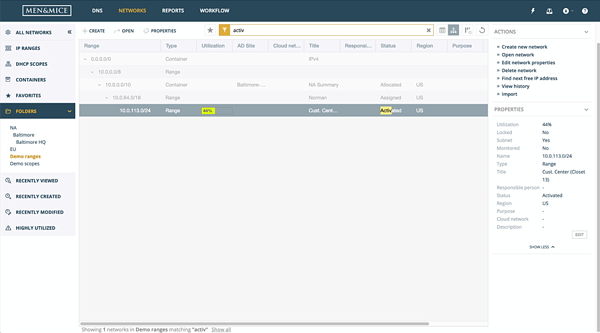 A common scenario for using the Workflow module would be a user requesting to add a new DNS record, modify or delete an existing DNS record. The request is created and is viewable to an administrator, along with other requests from other users in one comprehensive list, for approval or rejection, scheduling or immediate implementation. The new Workflow module can be licensed as an add-on to versions of Men & Mice Suite v9.2 or beyond. In any enterprise-level organization, transparency and a clear line of responsibility are crucial. The new, advanced Reporting module, enables users and administrators with the ability to utilize, save and export for download a variety of report templates and customized reports. In 2018, Men & Mice introduced simplified reporting features within the Men & Mice Suite. In Men & Mice v9.2, the new advanced Reporting module takes this several steps further, where reports can be tailor-made by correlating data and templates in just a few steps, scheduling the results to be generated daily, weekly or on a custom schedule. The advanced Reporting module can be licensed as an add-on to versions of Men & Mice Suite v9.2 or beyond. We’ll cover the two brand new modules for Workflow and Reporting in detail in the coming weeks. Microsoft’s software and services are present in just about every organization’s infrastructure, making the business of keeping critical infrastructure up and running consistent, reliable, and familiar for a lot of network managers. Familiarity of technology has its benefits, particularly when it’s possible to extend your network into the cloud within the same Microsoft ecosystem, as is the case with Azure cloud services. 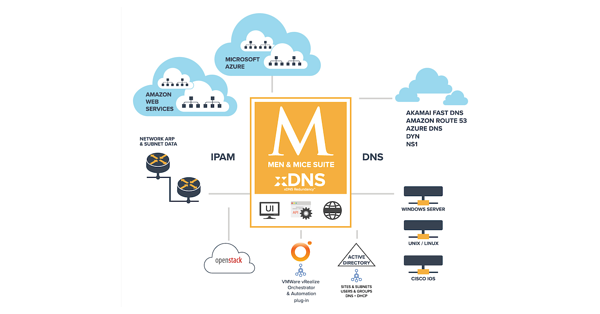 The first third-party solution to have integrated with Windows 2016 and Azure DNS, Men & Mice takes its long-term technological focus a step further by simplifying availability of the Men & Mice Suite for Microsoft Azure customers. From Version 9.2, the Men & Mice Suite is available through the Azure Marketplace. Deployment can be done in a matter of minutes instead of hours, with one-click install and easy-to-follow instructions. Simple as that. Not every network task requires human interaction. In fact, the life of a network manager can be simplified by automation in the right places. Men & Mice’s REST API offers the automation and customization needed to keep teams focused on the bigger picture and help keep networks secure. In addition to improved automation and customization capabilities, some other great new features introduced in Men & Mice Suite v9.2 include added IPv6 support in its network creation wizard, single-click system updates and improved management of subnets, ranges, scopes, and more. “Overlay solutions, such as the Men & Mice Suite, anticipate changing network needs, focus on compatibility between services and extend network investments while combating network conflicts and vulnerabilities. Likewise, Men & Mice’s dedication to establishing both technical and business partnerships for its solutions means customers can count on DevOps-friendly automation, synchronization and the unified visibility necessary to manage the next generation of enterprise networks.” — Sigfús Magnússon, Head of Product, Men & Mice. In the final instalment of our 5-part series on IPAM (and really, more broadly, DNS, DHCP and IPAM), we’re taking a look at sensibly managing security in a scattered network environment. From large-scale DDoS attacks to mitigating human error, security measures come in all shapes and sizes — often overwhelmingly so. Here’s what you can do to stay ahead. (TL;DR version: you need a DDI overlay to increase security on your network... and we happen to offer a great one). Each part presents real-world problems for which Men & Mice has provided solutions. The CTO of a Managed Service Provider, whose own network is the first line of defense to protect customers. Your services are sensitive, as gaining access to or bringing down your network would compromise those utilizing your MSP solution. The Lead Network Administrator of a mid-sized enterprise company recently expanding with new employees (and devices), through M&A activities, arriving daily. Onboarding new people is your technological challenge, balancing their need for autonomy and network resources with your requirement to maintain security protocols. While opposite in scale, these problems can wreak the same amount of havoc in both cases, and network security is of paramount importance, more than ever. Much of network security is inherently present in the technology used. Orchestration and synchronization between different software providers, interfaces and hardware, however, needs to be done well. Good security practices have to be sensible to be ubiquitous across the network, instead of obstructive. They have to be simple at their core and robust in their execution to prevent and solve problems. Let’s face it, your network is complicated enough. Misconfigurations or incompatibilities (what you do in one area of your network may not synchronize or be compatible with another area of the network, particularly with cloud vendors). Human error (Hey, we all make mistakes. But automating can remove this ever-present challenge, increasing the health of the network). Retaining network security on the DNS, DHCP and IP address level has been a core design principle for the Men & Mice Suite from day one (which was nearly 30 years ago). Managing the fundamental components of the network means great responsibility: if the foundations are compromised or out of sync, the entire network is at risk. The first security risk the Men & Mice Suite has addressed in the evolving world of hybrid network management, was to eliminate synchronization and misconfiguration hurdles between on-prem services and cloud services, then across cloud providers, enabling greater automation and utilization of network resources, independent of what are the services themselves. Then, we centralized management of these diverse and otherwise incompatible resources into one place. This backend-agnostic, API-first overlay approach gave way to the xDNS Redundancy™ feature, which helps further mitigate DDoS and other malicious attacks. If parts of the network become unavailable during an event like a DDoS attack, xDNS Redundancy™ prevents shutdown by switching to alternate resources. Once the affected resources are once again accessible, changes and updates are automatically synced across the entire network. Due to the Men & Mice Suite's powerful, compatible APIs different network resources are processed and managed the same way within the Men & Mice Suite. This means that replicating or migrating DNS zones or DHCP scopes between network environments requires no special consideration or prolonged processes, making your DNS, DHCP and IPAM more nimble. In addition, health alerts within the Men & Mice Suite provide the visibility necessary to proactively address misconfigurations, address space overlaps and malicious attacks while minimizing its effect on user experience. Likewise, unified audit trails within the Men & Mice Suite help identify the source of an issue and on what area of the network, providing richer data to inform proactive decisions. More often than any company would like to admit, especially in the age of post-Bring Your Own Device (BYOD) enterprise culture, security breaches can occur through human error. A simple password used across multiple mission-critical logins, a laptop stolen or left digitally unguarded, a malicious email attachment downloaded with malware, trojans or droppers, all can quickly take down or manipulate areas of your network, wreaking havoc. The Men & Mice Suite’s granular access controls, including its integration with Microsoft Active Directory, provide solid security templates for preventing unnecessary access (and therefore unnecessary vulnerabilities) on the network. Retaining existing configurations and implementing new ones is easy, replicated, synched and scales as needed. IT is no longer a department but a holistic and critical business resource. In 2019, we’ll be placing emphasis on closing the gap between IT professionals and IT users, on-prem and cloud teams as well as the increasing importance of overlays. It is our goal to showcase the importance (and value) of proper DNS and IPAM for businesses, and the effects (and context) of eliminating network hindrances that complicate or slow business decisions. 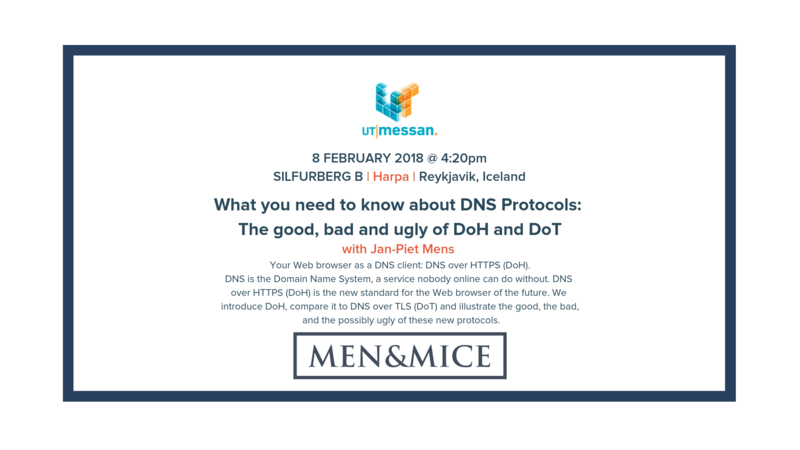 Here's a recent discussion during EuroBSDCon on DNS protocols and what will be changing in the future (DNS over TLS vs. DNS over HTTPS) by Carsten Strotmann on behalf of Men & Mice. We'll elaborate on this topic a bit more in 2019 during our talk at UTmessan in Reykjavik, February 8 & 9.